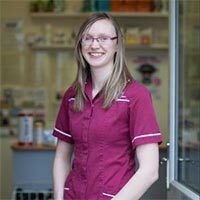 I qualified as a veterinary nurse in 2011 and have since also become a clinical coach, which means I assist in the training of student veterinary nurses. I started working for Twickenham Veterinary Surgery in March 2016 and have been kept busy ever since! My typical day is very varied: I assist with surgical procedures, monitor anaesthetics, look after in patients, assist with X-rays, complete insurance claim forms, and help out with reception duties where needed. I enjoy medical nursing the most. I love nursing a very poorly patient back to health and watching them run back to their owners with tails wagging, or in the case of cats, purring. At home, I have a cat called Ollie. He was a very ill stray cat when he came in to the vets. After lots of treatment and TLC I couldn’t let him go, so he has lived with us ever since.